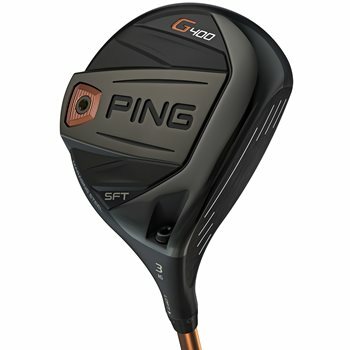 The Ping G400 SFT (Straight Flight) fairway wood has weight closer to the heel, a lighter swing weight and higher lofts to help square the face, promote right-to-left shot bend (right-handed golfers) and launch the ball higher. The G400 SFT features an extremely thin and more flexible maraging steel face that generates faster ball speeds to launch shots farther, higher, and straighter. The 17-4 SS crown is cast ultra-thin for weight savings to optimize the CG location and to increase total MOI for full-face forgiveness while crown turbulators increase ball speed and provide a captured look. The machined back weight enables you to customize your swing weight and you can fine-tune your launch conditions prior to a round by adjusting loft up to +-1º. The face texture reduces spin, and the head’s cascading sole increases face flexing for higher launch.